Super Rich Red Ruby Loose Gemstone in Round Shape, Great Looking Red Fire in 6.8 mm, 1.52 carats This Stunning Genuine Natural Ruby Gemstone Displays A Stunning Vivid Open Pure Rich Red Color Combined with Excellent Clarity, Great Cut Produces Magnificent Red Fire. A Beautiful Ruby Stone In A Very Desirable Shape And Size. A Very Attractive Rich Look, Very Bright And Lively, A Hard To Find Item in This Quality. Note For A Personal Detailed Description Of This Beautiful Ruby Gemstone Please Contact Us And It Will Be Quickly Provided To You. A new, out-of-this-world collection of beautiful Ruby gems have just made their way to AfricaGems. Boasting gorgeous color, cut, and clarity, these Burmese Ruby beauties will truly steal the show. These valuable gems are not only breathtakingly beautiful but they are good investments as well as Burmese Rubies will only increase in worth. This new selection offers dazzling loose ruby faceted gems with great color as well as unbelievable matched pairs- perfect for ruby earrings! You must take a look at these stunning ruby gems, and remember that as striking as each piece is online, they are only more outstanding in real life. 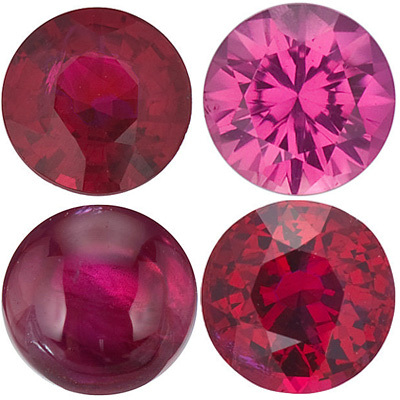 A brand new selection of fine quality loose rubies have arrived in our vaults. The quality of these ruby stones is exceptional. Deep vivid red colors, excellent cuts and fine clarity. In fact some of these rubies are the finest quality available-anywhere. These rubies would be ideal candidates for a 5th Avenue quality and look ruby engagement ring for a fraction of the cost! All of these new rubies have tier 1 gemological laboratory certificates such as GIA, GRS, AGL. Keep in mind that these rubies look 10x better in real life. Enjoy! 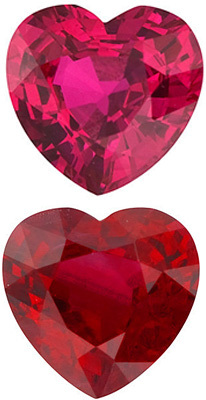 Rubies and sapphires are both aluminum oxide which is more commonly known as corundum in the gemstone community. So why the different names? It was only after advancements in gemology at the beginning of the 1800s that it was understood that ruby and sapphire were both corundum and that all red gemstones were not rubies. One can find references in many historical documents that refer to "carbuncle" or "carbunculus" a now obsolete word meaning "small coal, charcoal or ember". The definition of carbuncle has been dated back to the 13th century, but red gemstones have been use for jewelry and artifacts for thousands of years. The name ruby comes from the Latin word "ruber" or "rubeus" which means red. Until the 1800s, ruby was a name that was used and mistakenly applied to many red gemstones including red spinel and red garnet gemstones and the term carbuncle was used frequently for what we now know is red garnet. In spite of the confusion in names, ruby has been used for at least 2000 years and has been thought of as regal and / or sacred depending on the culture but it has always been highly prized. Ruby is the only corundum that has its own name. Corundum that is any other color is called sapphire and a color descriptor is used as a prefix. Like most gemstones, ruby was valued as a talisman or for its medicinal value as well as for it beauty. It was said that rubies could boil water and that they brought good luck and good fortune to their owners. They are supposed to safeguard against evil, give peace of mind, courage and insight. Over the centuries, warriors have worn rubies to make themselves invincible. Some say that rubies kill poisonous reptiles and are an antidote against snake poison but I sure wouldn't want to put a whole lot of faith in that. Rubies were supposed to prevent bad dreams, and provide peace of mind and insight. It is often thought of as the gemstone of passion and love. And there are even more attributes ascribed to the ruby that are not covered here. It has been said that in ancient Imperial China, bureaucrats wore badges to show rank. 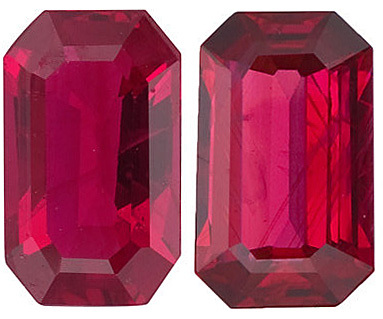 The top ranking bureaucrats wore red stones which included ruby and red or pink tourmaline. Ruby is referred to in the Bible (usually as carbuncle) not only as one of the 12 Stones of the Breastplate, but in Exodus, Ezekiel and Isaiah. Ancient Sanskrit writings celebrate the ruby as the most precious of all gemstones. In India, it was believed that ruby was the "King" of gemstones and that they possessed the power to allow the owner of the ruby to live in peace with their enemies. In England, ruby was the stone for coronation rings and also set into crowns. Rubies were also set in rings for bishops and cardinals. There is no question that it is a regal and royal gemstone. Rubies - It's All About Color And That Color is Red, Red, Red! As with all gemstones, one needs to consider color, clarity, cut and carat weight. When thinking about rubies, color is the most important factor with clarity second and cut and carat weight after that. 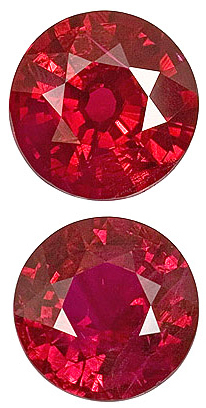 One of the hardest things to pin down when looking at rubies is the dividing line between ruby and pink sapphire. After all, pink is in essence pale red and it is not a distinct hue. There is no official dividing line but there are general guidelines. It is all about hue, tone and saturation. 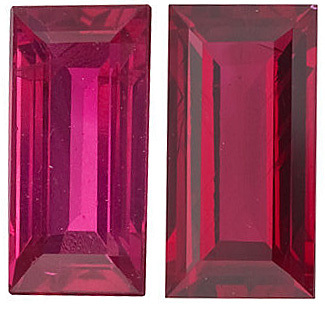 The debate among gemologists and gemstone dealers continues with some feeling that all red corundum including pink should be called ruby and others want to keep the distinction between ruby and pink sapphire. Ruby is red and the more true the red hue, the better. Rubies have primary and secondary hues so pure red with no secondary hue is just about impossible to find. Believe it or not, the secondary hue of a ruby can help a gemologist determine the country of origin of a ruby. 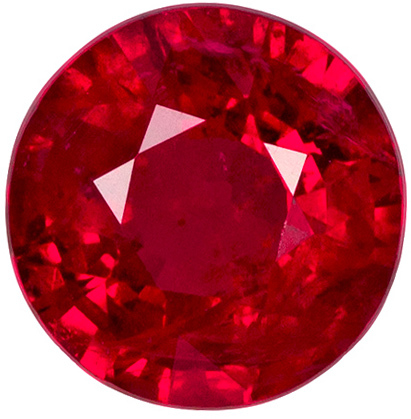 For a ruby from Burma (now officially the Union of Myanmar) the secondary hue is pink; ruby from other localities can have pink, orange or violet secondary hues. Some experts use a guideline of 85% to 90% red (primary hue) to 10% to 15% secondary hue for the most desirable, expensive and rare rubies. These gemstones are truly collector's gemstones. Using the GIA rating system, a ratio of 80% / 20% is probably the average for good rubies on the market today. Red tone in a ruby should be between 75 and 80 percent to be ideal. Rubies should not be too dark or too light in tone. If they are below 60% they will appear washed out and those with tone above 80% will be very dark. 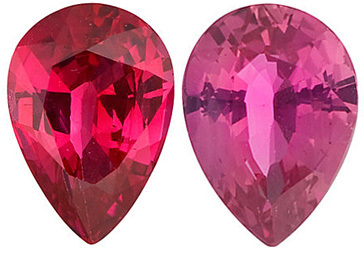 Gems that are less than 50% tone are by definition pink sapphire and not ruby. Saturation ranges from "grayish / brown" to "vivid". Think of the word "intensity" when evaluating saturation. There are 6 levels of saturation. Most experts believe there is nothing that can compare with the saturation seen in Burma-type rubies. Many experts will tell you that no other red gemstone can match the over the top saturation of a Burma-type ruby. There comes from a special fluorescence in Burma-type rubies. But that doesn't mean that top quality Ruby can only come from Burma. There are fantastic Burma-type rubies being mined in Kenya, Tanzania, Thailand, Cambodia, Vietnam,Madagascar, and Sri Lanka. 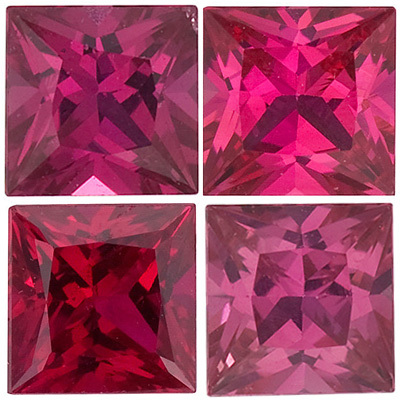 Bottom line, a buyer should look for a bright luminescent crimson (deep purplish) or fiery vermillion (vivid reddish - orange) red color in a ruby. Many years ago, the term "pigeon blood" was first used to describe the most ideal ruby color which is slightly bluish or slightly violet red. But this is the Holy Grail, the stuff dreams are made of, the most rare and expensive of ruby colors. There are many beautiful and valuable rubies available that at not "pigeon blood" in color. Ruby is a Type II gemstone and by nature has natural inclusions. Rubies have rutile inclusions - threadlike inclusions often called "Silk". Those inclusions are noted in a range from VVS (Very Very Slightly included) to Included 3 - Prominent (Inclusions which have a pronounced affect on the beauty of the stone and possibility the durability). Unlike the clarity scale for diamonds which starts at IF (Internally Flawless), the GIA clarity chart for colored gemstones starts at VVS. 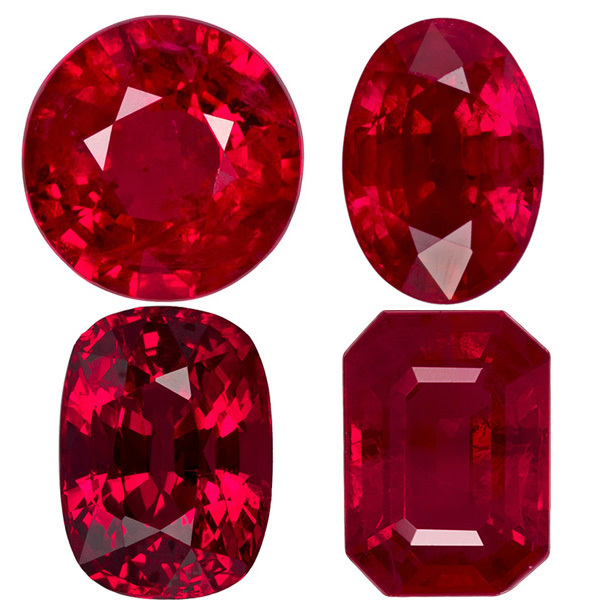 Other types of gemstone reports can show a ruby with more descriptive report - for example, an AAA Grade and a description of eye clean, medium dark pinkish red to red, brilliance, excellent cut and polish would be a real prize and very expensive - a true collector-connoisseurs gemstone. 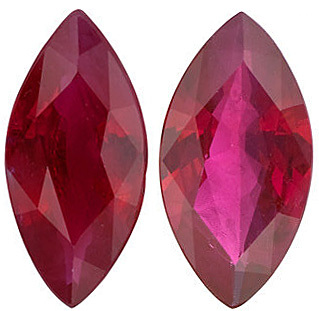 Rutiles can be important player if one is considering a "star" ruby. 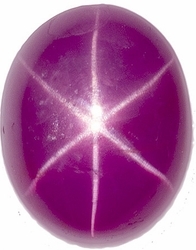 Star rubies are usually cabochon cut rubies, which are very included. The rutiles are the things that create the star. 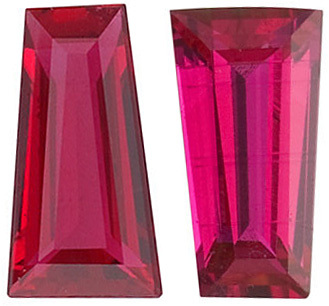 Ideally, when one is considering a star ruby, the star should have six "legs," the legs should be as straight as possible and the star should be centered to the gemstone but which "moves" as the gemstone is moved. While there are some very large and incredibly valuable star rubies in museums and crown jewels around the world, the average star ruby is not large or extremely expensive. The cut of a ruby is almost as important as the clarity. Well cut rubies will show off the color and clarity and the ruby will be positively brilliant. Rubies are cut in just about every shape with some gemologists believing that oval, pear and cushion cut are the best for ruby because those shapes work best with the outline of the rough. But round shapes can be more brilliant but are not commonly found in larger carat weight rubies. Carat weight is arguably the least import of the 4Cs when it comes to rubies. Just be aware that a smaller ruby of top color and clarity can be much more valuable than a larger ruby of lesser color / clarity. In fact a top quality ruby can be more valuable per carat than a diamond of similar size because there are far fewer top quality rubies than there are top quality diamonds, especially when one is looking at carat weights over 3 carats. Like all corundum, ruby is a 9 on the Mohs scale of hardness and is suitable for everyday wear. A buyer who is considering the purchase of a loose ruby gemstone should request a professional gemological report in order to help them know exactly what they are purchasing. Grading reports may be shown using a numerical value and / or percent or be given an overall letter (B thru AAA to GEM) and description "grade" for the clarity and color - it will depend on with which laboratory the gemologist trained. There are several recognized laboratories like Gemological Institute of America (GIA - uses the numerical scale), International Gemological Institute (IGI), International Gem Society (IGS), European Gemological Center (EGC) and more. Almandine garnet, fluorite, hyacinth, pyrope garnet, topaz, and zircon can also be mistaken for ruby. These are genuine gemstones they just are not corundum. There are glass imitation and doublets on the market pretending to be rubies. Most of these have garnet crowns and are glass underneath or the top part of the stone may be a natural clear corundum with synthetic ruby underneath. Synthetic rubies have been around since the beginning of the 1900's so please be aware that that red stone in that piece of antique piece of jewelry may not be a genuine ruby. In this case, there is no guarantee that Grandma's huge ruby ring is a natural ruby. Typically rubies over 3 carats were and are very, very rare and unless Grandma was very wealthy, chances are she couldn't have afforded a huge ruby. 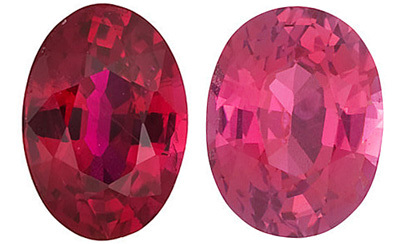 Synthetic ruby is still being manufactured but primarily for use in lasers, medical equipment, and watches. 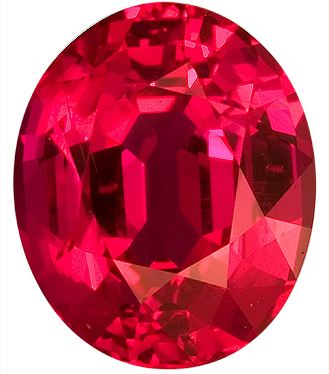 Without question a completely natural, untreated and unheated ruby of top color and clarity will be more valuable than a heat treated ruby. 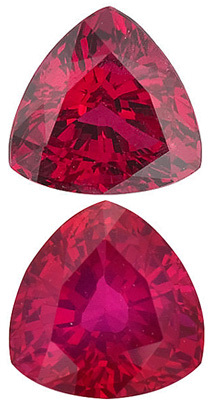 Some will quote a price as much as 3 times the cost of a heat treated ruby of the same size. That said it is estimated that 90+% of all rubies are heat treated. Heat treatment is considered a natural treatment, i.e. a continuation of what Mother Nature started. Heat treatment helps improve the color and clarity of a natural ruby and is considered a permanent treatment requiring no special care. There are also other treatments to natural rubies such as filling of fractures (flux treatment), surface diffusion (a type of coloring treatment), oiling, dyeing and waxing that are intended to improve the color or clarity of the ruby. Some of these treatments may require special care when setting or cleaning the gem, may affect the overall durability of the gemstone and may not be permanent. In the US, gemstone treatments must be disclosed. Some large retail chain stores may have a generic statement to the effect that precious and semi-precious stones may have been treated or enhanced but the sales personnel do not have the specifics about any treatments for a specific gemstone or gemstones especially for "accent" gemstones. If purchasing a large gemstone, 1) ask for an individual gemstone report from a gemologist or baring availability of that, ask the sales person to write on the sales receipt any treatment types that they are aware of for that specific gemstone, what the return policy is for the store is and take your gem to an independent gemologist appraiser. If you didn't get what you paid for then take it back to the store. It is best to buy from a gemstone dealer you trust when purchasing an expensive gemstone. Please be aware of the "Burmese Jade Act of 2008" that blocks the import of gems including rubies and jadeite from Burma (Union of Myanmar). It does allow for sale of Burmese Gems in the US before the ban went into effect in September 2008. A gemstone dealer is required to provide records to show that ruby or jadeite imported after that date was not mined in or extracted from Burma.